1) Paint. Whether you spray paint your collect or get a little more artsy with some acrylic paints, the choice is yours. You can combine techniques and methods to achieve some really cool pumpkins. Apartment Therapy has some fun ideas. 3) Ribbons. Grab your glue gun and go to town. Add some pizzazz with some ric rac, satin, grosgrain or whatever else suits your fancy. 4) Puff Paints. For a little more control and intricate detail, use puff paints to squeeze your design on to your pumpkin. Young House Love has a great tutorial and ideas on what to put on your pumpkins. 5) Rub on decals. Simple and mess-free. Choose your design and rub it on to your pumpkin. No drying time. They are ready to go in a pinch and look fantastic. A Cultivated Nest has some wonderful examples. 6) Stamps. With some patience, you can use Stazon ink and some of your favorite Halloween themed stamps to decorate your pumpkins. This would be a good way to incorporate some decorated gourds into your Halloween. 8) Sequins. Sequins have never looked so good. A small bag of sequins and some Halloween colored straight pins would work wonders on a plain pumpkin. 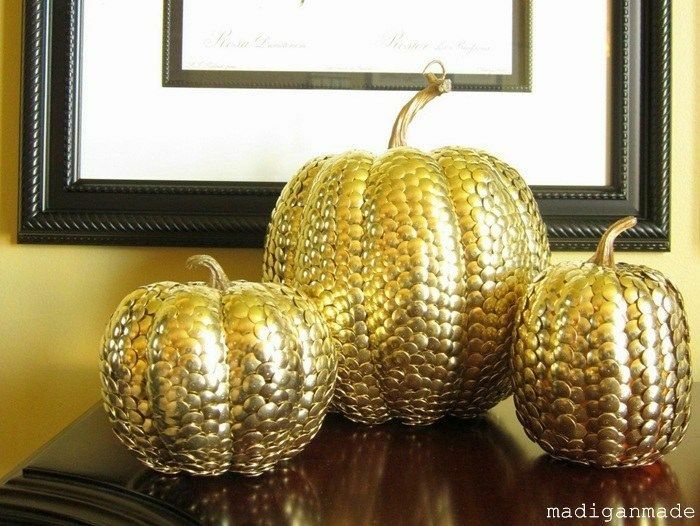 Simply use a straight pin to secure each sequin to your pumpkin. Sparkle and texture, love it. Making Lemonade will show you how. 9) Fabric. Use some fun, spooky fabric and mod podge to glue your fabric to the pumpkins. Easy to do and completely customizable with your choice of fabric. 10) Decoupage. 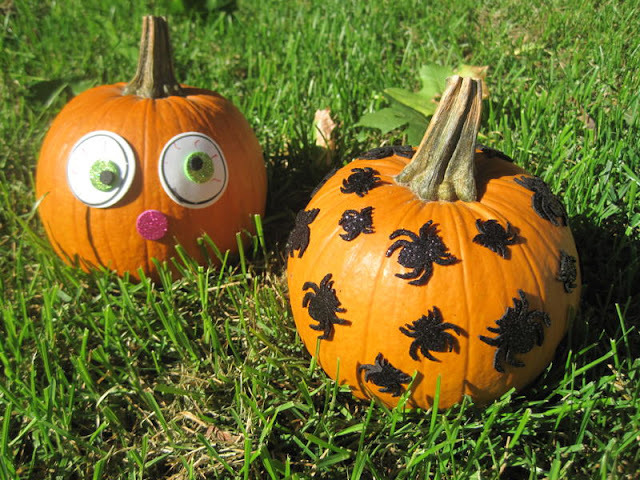 Print out some clip art, clip them down and mod podge your clippings to your pumpkin. A fun photo collage from Halloweens past might make a fun, unique display. Don’t stop there though! Decoupage some pretty fall leaves onto your pumpkin. Or some vellum decals. Or use tissue paper with some fun patterns like Kimberly did. Go crazy. 11) Thumb tacks. This is genius. Cute and easy. You can spray paint your thumb tacks any color you want for some more variation. There’s a great tutorial at Madigan Made. 12) Polka Dots. 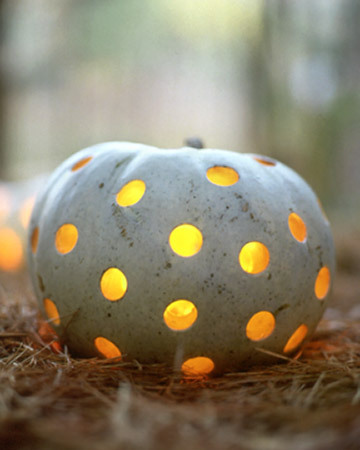 Grab your power tools and make this cute little pumpkin. All you need is the drill and drill bits. 13) Chalkboard paint. Paint up your pumpkins with some chalkboard paint and then use chalk to decorate. Want to change it up a little? Erase your pumpkin and you’ve got a blank slate to decorate again! 14) Stickers. If you have little ones, this would be a fantastic diversion while you do your stickers (or whatever), let your little one do their own pumpkin. Your little one gets his Elmo pumpkin and you don’t have to dissuade your stubborn little pumpkin to leave your stickers alone. There’s a tutorial at Babble.com. 15) Flowers. 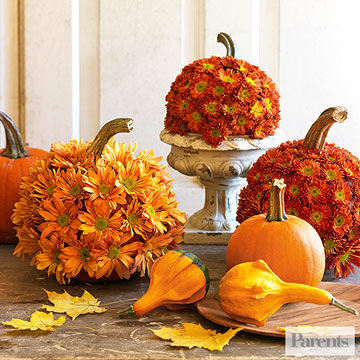 Whether you opt for real blooms or ones of the silk variety, you can create all kinds of pretty arrangements with this combination Use your pumpkin as a standard vase or get a little more creative and put them all over the outside. BHG.com will show you how. Good ideas and they can carry well until Thanksgiving. I like the stylish and almost elegant look of some of these pumpkins, such a contrast to just carved jack o’ lanterns. Thanks for the ideas, who says you have to carve them anyway? I love the ideas I’ve been seeing this season.